The Gitga’at community of Hartley Bay is located 145 kilometres southeast of Prince Rupert. The school there houses just 55 students from kindergarten to Grade 12. Tiny and remote, with a close relationship with the local Tsimshian band council, Hartley Bay is perfectly suited for an experiment in a new style of teaching. Instead of taking notes from a chalkboard, First Nations students at Hartley Bay learn from their elders by visiting members of the community to learn the traditional names and uses of plants. By interviewing local authorities, the students discover how blueberries–or smmaay, as they are known in the Tsimshian language, Sm’algyax–can be eaten during feasts or used to dye clothes or treat diabetes. Each fact is carefully recorded in a field notebook, which is then used to create a summary of the plant that incorporates both scientific and aboriginal-based knowledge. Thompson, who is Tahltan, created a series of six lesson plans on traditional plant knowledge for students at Hartley Bay. In it, she outlined a series of exercises that teach the youth to become researchers. Each student was assigned a culturally important plant, and then went into the community to learn about it. Along with the traditional, botanical, and common names of each plant, they recorded whether it was used for food, medicinal, material, or ceremonial purposes, eventually creating a Gitga’at plant booklet. Results have been encouraging. Thompson remembered one student who returned after interviewing the chief’s wife. Although multicultural education in the past has attempted to do this, some researchers are coming to the conclusion that it has not gone far enough. Statistics from B.C.’s Ministry of Education state that in the 2001-02 school year, more than four times as many nonaboriginal students passed the mathematics 12 provincial exam compared with aboriginal students. First Nations curriculum developer Veronica Ignas said that this is partly because aboriginal and nonaboriginal students see the world differently. Classes like mathematics and science, as they are usually taught, focus on abstract concepts that are divorced from daily experience. This approach can be difficult for aboriginal people, who often have a world-view that is more connected to concrete manifestations of nature. “Students are motivated and do best if the information they’re taught is relevant,” Ignas said. Rather than look at this difference in perception, Ignas said, multicultural education typically focuses on the “four Ds”: diet, dress, dance, and dialect. What is needed, she argued, is a more fundamental acceptance of alternative ways of knowing. Now, a handful of schools in rural towns like Hartley Bay and Gitxaała are working with researchers from UVic and UBC to integrate traditional ecological knowledge (TEK) into their curriculum. UBC anthropologist Charles Menzies has been working four-and-a-half years with Ignas, Thompson, and other academics and First Nations representatives on Forests for the Future, a project that collects TEK for use in both resource management and education. Menzies’s project stems from recent attempts by researchers to give something back to the communities they study. Traditionally, anthropologists visited a community, extracted the information they needed, and left. This expropriation of knowledge is now recognized by some as being just as problematic as the removal of gold and other physical resources during the colonial era. Now, researchers such as Menzies are trying to change this process by returning the information they collect in the form of educational resources such as those developed by Ignas and Thompson. Menzies is supervising the creation of seven unit plans by Ignas, Thompson, and others to be used as learning resources for teachers. Simply put, traditional ecological knowledge is an ever-evolving body of knowledge about the environment and its relationship with human beings that is passed down through generations. In a typical class, community elders teach the children about the ways of living that have been passed down in the community for centuries. Within the Tsimshian world, humans have social relationships with plants and animals. For example, in math class students learn the different Tsimshian ways of counting (people, long objects, people inside a canoe, size of animal catches, and general). As well as learning their Latin names and scientific characteristics, students discover traditional names and medical and ritual uses of plants. Some critics argue about the validity of TEK, because it is inherently different than western science. Being based on oral testimony and holistic in nature, it has also faced opposition from scientists. Today, TEK is becoming more widespread in fields such as natural-resource management. Starting in the 1980s, it began to be used in fisheries management as a complementary source of knowledge to that gathered by western-trained biologists. Part of this process is due to a realization that science does not have all the answers, at least with respect to managing natural resources. For example, in B.C. federal fisheries management makes predictions of how many salmon will arrive every year, forecasts that are based on empirical evidence collected by biologists. However, the actual returns often don’t match these predictions. In the 1980s and ’90s, that system started to change. “Fisheries began listening to what local-level fishermen were saying [and finding] it was as good as or better than what the managers were saying,” Menzies said. 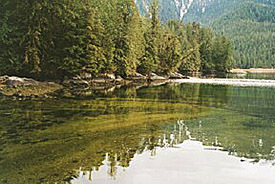 When applying TEK, a fisherman would watch a particular fishing spot for years, observing when the salmon arrive and then acting on his observations. By accumulating this observational evidence over decades, and sometimes generations, a body of traditional ecological knowledge is formed and can be used to predict the levels and activities of fish in a given area. Variables such as shifting weather patterns or other environmental changes are observed by the fisherman and noted with regards to their effect on the fish population. By using such long-range data, the TEK can sometimes be more effective in predicting salmon stocks than biological data, which is often collected during intermittent field research trips over a short period of time. Even though scientists were skeptical of the storytelling format of TEK, when collected and distilled into a form of data that can be manipulated in the same way scientific field data is, it became easier for them to use. “When you incorporate and mesh science-based managerial systems with local and traditional knowledge…it gives you more tools to manage the resources,” Lewis said. TEK has also gained popularity due to an increased desire on the part of government to include First Nations groups in the decision-making processes that affect their lives. Now that some scientists are validating the claims made by TEK, it is being used more commonly and has found its way into schools like Hartley Bay. All of the TEK-based curriculum is designed to fit into the mainstream school system. In order to do this, each lesson plan is designed to fit with the province’s “prescribed learning outcomes”. For example, Ignas’s unit Two Ways of Knowing: Traditional Ecological Knowledge and Scientific Knowledge fits the province’s prescribed learning outcome “describe how scientific principles are applied in technology.” To assist teachers, each lesson plan includes a list of its corresponding learning outcomes. However, even with relatively simple integration within the provincial system, it is up to the judgment of individual teachers to actually use the material. The Ministry of Education currently allows educational professionals to select their own learning resources, as long as the material passes a formal evaluation process at the provincial or the district level and fits within the learning outcomes set by the province. This system, which has been in place since 1989, is designed to allow schools more autonomy to choose resources that meet their individual needs. Since there are relatively few First Nations teachers, the more nonaboriginal teachers who attempt to integrate the curriculum, the better. Yet it can be hard for western-trained teachers to impart indigenous knowledge, both politically and conceptually. They must be taught to look at the world in a new way, which can be difficult, so alternative learning sources often sit on the shelves, unused. Peter Freeman is a nonaboriginal teacher who integrated TEK curriculum in his science classes at Charles Hays secondary school in Prince Rupert. Although he felt the material was more applicable to communities such as Hartley Bay that have more direct access to the environment, he said it was still useful. Freeman’s classes held discussions on the pros and cons of traditional knowledge, and students were generally interested in the material. “Some of the students may know and understand a lot more than I do, and they enlighten all of us,” Freeman said. A big part of incorporating TEK into the classroom is gaining the acceptance and respect of the community–something that can be difficult for an outsider. As well as gaining acceptance from the community, teachers are often afraid to use First Nations material because of concerns over political correctness. However, Menzies said that feeling bad about the effects of colonization should not be an issue. “I don’t know how making a teacher feel guilty will make the world a better place,” he said. By using a prepackaged learning resource, Menzies said, the worry is gone. “[A teacher] would just grab it, open it up, and work with it,” he said, adding that mainstream society has much to learn from incorporating this kind of material into regular schools. “I want to see beyond First Nations,” he said. For example, when studying Canadian history, students focus on the story of the nation from a strictly European point of view. There is a profound lack of any sense of the past as seen by the country’s First Nations, Menzies said. By sharing ways of perceiving the world, Hill said he thought that education could help these groups reconcile what has been, at times, a difficult relationship. “Maybe these little courses give a little bit of understanding, rather than the stereotypical view that seems to exist out there.